Remodeling your bathtub is an important job, and here at New Bath Walk-In Tubs you can count on us to provide you with the best walk-in bathtubs available. Regain your bathing independence in style with a walk-in tub from New Bath! Our walk-in baths make bathing safer and more comfortable. Don’t risk falling by stepping over a high walled tub! Bathe with ease in a walk-in tub from New Bath Walk-In Tubs, and enjoy the benefits of a spa right in your own home! With our heated hydrotherapy jets and air spa system, you can relax and ease joint pain. You will get a quality walk in tub at a fraction of the price! 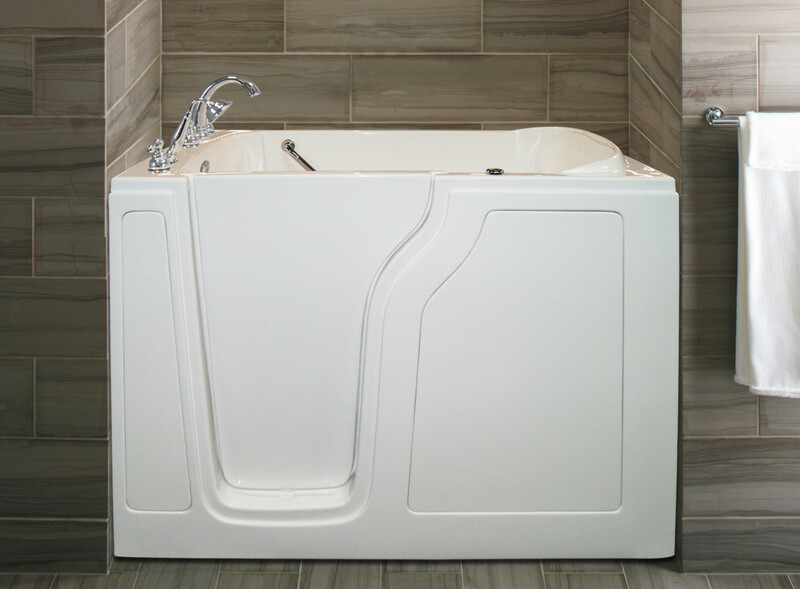 New Bath Walk-In Tubs carry a complete line of premium quality walk in tubs that are ideal for people with limited mobility, elderly, disabled, and people that experience pain with arthritis, stress, diabetes, high blood pressure, and other conditions. We are a dealer of the Jacuzzi Step In Tub in Central Ohio; including the Cincinnati and Dayton areas. 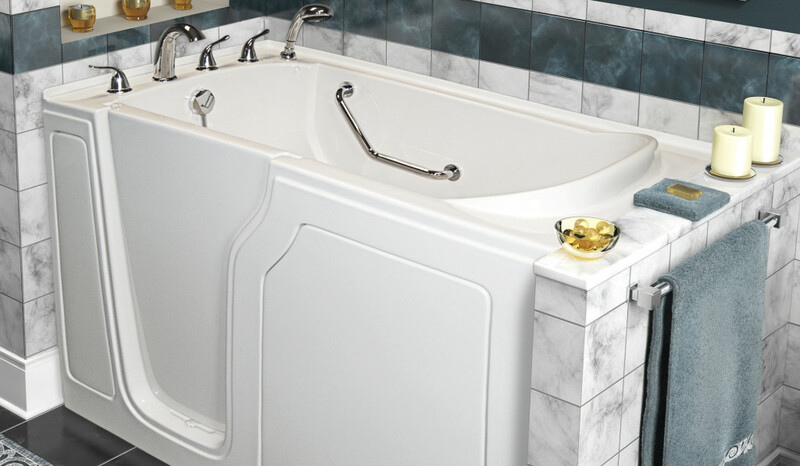 Luxurious, safety and functionality are the inspiration behind the design of every New Bath Walk-in Tub. We utilize premium materials, advanced methods and adherence to strict quality guidelines to create a durable, high gloss finish that is easy to clean. We can assure you that you won’t find a better walk in tub. New Bath Walk In Tubs has several models and sizes to fit your specific needs. Our walk in tubs can be made to accommodate any bathroom application. Some homeowners require simple soaker walk in tubs with the primary focus being safety. The built-in seats, watertight door seals, and a low threshold entry provide customers with the piece of mind they need when taking a bath. Other customers choose walk in safety tubs with hydrotherapy and jets that include air and whirlpool massage systems to manage arthritis, poor circulation, back and leg pain, as well as many other health issues and concerns. Browse our gallery to view various New Bath Walk-In Tub installations featuring before and after photos. Whatever your needs are, we are confident that we can help you find the right walk in tub that you need. The price of a New Bath Walk In tub depends on a variety of factors; including the current layout of your bathroom, electrical, plumbing, current water heater, size and style of tub. We do provide a free service where a Safety Specialist would come out to your home and preform a safety inspection. They will look at the scope of work, take measurements, and leave you with a written proposal of exactly what your investment would be. the New Bath Walk In Tubs are 20% to 30% more affordable than other companies. Call our toll free number today to schedule a free in home visit: 800-620-1882 or to get a free informational packet. New Bath Walk-In Tub installers are trained and certified. All of our team members are highly skilled and experienced so you know the project will be completed correctly the 1st time. We can install your Walk In Tubs in as little as one day. Please browse our before and after pictures of New Bath Walk-In Tub Installations throughout Ohio, Indiana, and more. Our factory tested walk in tubs are built by trained technicians. Before any walk in tub leaves our factory, we perform a variety of tests and careful inspection of the frame, finish, overall construction, and specific water tests. Once the walk in bathtub has passed all quality assurance points it is signed off by a quality assurance safety specialist and carefully packaged and shipped. New Bath Walk-In Tubs proudly serves Columbus, Dayton, Cleveland, Cincinnati, Ohio; Indianapolis, IN; Kentucky and surrounding areas. We strive to make bathing easy, safe and enjoyable for our customers. Our walk-in tubs are affordable and can be installed in as little as one day! Don’t wait for an accident to happen, get a walk-in tub today and rest assured that you can have bathing independence for years to come. See what our professional installers can do for you! Call today 1-800-620-1882 , and experience the difference!